It’s borderline alarming. But most definitely fascinating. The growth of digital data worldwide is accelerating at an unprecedented, virtually incomprehensible rate. A new study estimates that the current global storage capacity for digital information totals around 295 exabytes – an exabyte equals one billion gigabytes. Picture a stack of CD-ROMs reaching from the floor beneath your desk to 80,000 kilometers beyond the moon. The study, conducted by University of Southern California researchers Martin Hilbert and Priscilla Lopez was published in Science Express on February 10 this year, and documents the rise of global digital data between 1986 and 2007. The shift has been astounding. In 1986, 14 percent of earth’s data was stored on vinyl records. 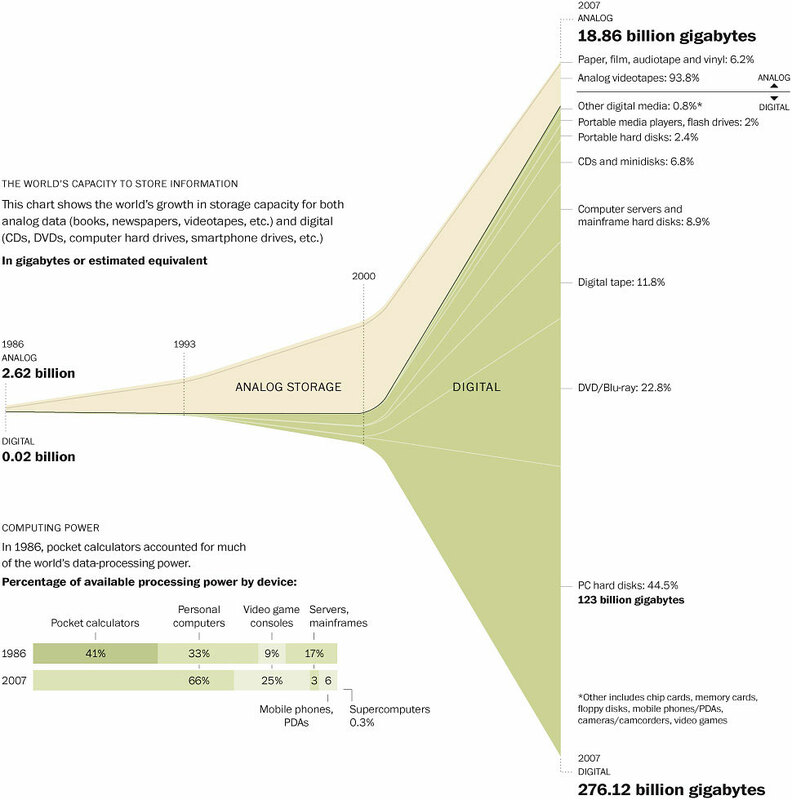 In 2000, 25 percent of all information was in digital media form; and by 2007 (the last year of Hilbert’s and Lopez’s study), 94 percent of all information storage capacity was digital, totaling 276 exabytes. According to the study, computing storage capacity is growing at around 58 percent per year. The ability for enterprises to capture, collate and analyze organizational data is becoming simultaneously more important and difficult to manage. Therefore, as posited in Yellowfin’s blog – Shrewd data management key to effective Business Intelligence – efficient data management is becoming increasingly crucial to ensure optimum performance from any Business Intelligence (BI) solution. In light of these trends, a new survey by Australian-based Atlis Consulting, revealing that investment in business analytics and data mining will substantially increase in 2011, comes as no surprise. A recent Aberdeen report, Turning Pain into productivity with Master Data Management, found that those organizations that were able to effectively identify and classify their burgeoning data assets, realized a 23 percent reduction in their time-to-information cycles, and a 15 percent increase in their customer satisfaction and retention rates. The benefits are enormous. However, they are also becoming progressively harder to realize. With increasing data volumes, leading to increased infrastructure requirements, complexity and strain on IT resources, achieving just-in-time analytics with traditional data warehouse technologies is becoming burdensomely slow and/or beyond the financial means of many organizations. A new Gartner report, The State of Data Warehousing in 2011, predicts that 2011 will be an “inflection point” for data warehousing. Gartner has labeled it the “most significant inflection point since its (data warehousing’s) inception”. “In 2011, we are seeing data-warehouse platforms evolve from an information store supporting traditional business intelligence platforms to a broader analytics infrastructure supporting operational analytics, corporate performance management and other new applications and uses, such as operational BI and performance management,” said Gartner VP and analyst, Donald Feinberg. Gartner says that vendors must revamp their data warehouse platforms to deal with growing data volumes, taking advantage of new and exciting technologies, as more enterprises collect greater data volumes while simultaneously demanding real-time reporting and analytics. Another Gartner report, Data Warehousing Trends for the CIO, 2011 – 2012, says that growing interest in data warehouse appliances is being driven by the demand for simplicity and speed. Gartner predicts that by 2013, data warehouse DBMS vendors will combine their offerings to form a type of complete information management platform. “The DBMS will become, above all else, an execution platform. It will support and perform data management and integration tasks as well as for query and analysis execution,” said Gartner research vice president, Mark Beyer. These comments came as Ingres moved from ‘Niche’ player to ‘Challenger’ status – just behind Microsoft – on Gartner’s latest Magic Quadrant for Data Warehouse Database Management Systems. The demand for new-generation business analytics solutions – comprising agile BI and analytical database technology that have the capacity to quickly, effectively and cost-efficiently produce actionable intelligence from ‘big data’ – is set to skyrocket. So. How do you plan on making decisions on your mushrooming data assets?